A very good friend of mine, Mandy, writes her own blog. She, along with a few other cross country friends, got me inspired to start this blog. Mandy has made the most of it by managing to do giveaways to her readers and has even recently become a published author! Miss Mandy has issued a challenge: 28 blog posts in 28 days during the month of February. I think I'm up for it. It's going to require dedication, but also a ton of material to cover! I'm going to do my best, because I am wildly competitive (even though there is no prize to be had) and because I love to challenge myself. It's much more fun than preparing receipts for our taxes...or doing laundry...or putting away our wintery dishes. In the meantime, I occasionally check in on my stats for this blog - who reads it? Where do they come from? While I can't nail down specifics like names or towns, I am astounded at the people who come to the blog, and where they come from. Based on my stats, I have people from the US (of course), the United Kingdom (special shout out to BFF Bexy! ), and even occasionally, Greece. Oddly enough, I also have regular readers from Spain, Hungary, China, Slovenia, Sweden, Denmark, Germany, Latvia, Canada and Russia. Isn't that wild? So for all my international peeps - thank you for taking the time to check out our little corner of the world. And hopefully, by Day 28...I won't be putting you all to sleep! This winter has been ridiculous. We have just been spanked by snow repeatedly since the day after Christmas - not a week has gone by without a significant storm. Last night was no exception, and we got another 7-9 inches. I'm not really sure how much we got, because it just went on top of the 3 feet we already have. So this morning was, yet again, more cleanup. Have I talked about the snowblower that kind family friends Connie and Kevin gave to us, since they got a new one? We would either be divorced or crippled by now if it weren't for Connie and Kevin's kindness, as this snowblower (which is 10 years old but still works like a charm) has been used and used again. Not just to clean out our driveway and walkways, but also to create a path for me to take a full wheelbarrow to the manure pile. There are few things more wonderful than seeing your guy out there, braving the elements for you, while he enjoys the horsepower (instead of shovelpower) and seeing the snow get demolished before his very eyes. Meanwhile, I'm at the window, snapping pictures with a cup of coffee, still wearing my pajamas. I'd already fed and turned out the horses and cleaned the barn, but still. You get the point. Thank you, Kevin and Connie!!! Remember the Conga I got a photo of the other day? I did one better today. The same thing happened when I went to catch Casey to work with her....so I decided to get it on video. I find this so hysterical that they all follow along happily, and then stop like train cars when the leader (Casey and I) stop. We are at a whopping 17 degrees as I type this, and when I went out to feed this morning, it was an unbelievable -8 degrees. Even though I've stolen Matt's Mad Bomber hat for the time being, am layering hand warmers with several pairs of gloves and mittens (and seriously contemplating heated gloves for next year's survival), and wearing clothes that can only be considered Eskimo chic, it's important to remember that it can always be worse. At least, with snow, the horses stay relatively clean and with their cozy blankets on, somewhat easy grooming maintenance. I took these photos a few months ago, when this was not the case. Oh, yeah. Mud Wrestling. 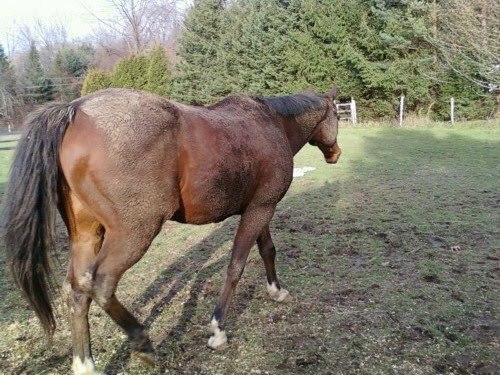 Somehow, the horses usually find in Spring or Fall, the muddiest spot in the whole field, and go to town. Each one of them. 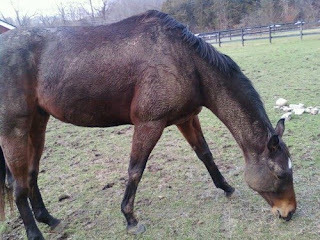 So grooming becomes an Event, and at the end, you are eating and breathing in more mud, and it's in your eyes, ears, and all over your clothes. The horses find this incredibly fun and I think they do this on purpose. Negative 8 degrees. It's supposed to be just as cold tonight and we'll have a high temp of 13 tomorrow. Mud, or arctic temps - which would you prefer? At this rate, it's almost a toss-up! Winter in Paris...and a Conga! I wonder what winter in Paris is like. Well, I know what Paris is like in winter! Paris and all of her fieldmates are all warm and cozy in thick winter blankets, enjoying all the hay they can handle. This little guy is Angelo, a cutie I recently started working with. I believe he raced, but minimally - he was born at Akindale. Even though he's only 3, he is just an absolute mush and a doll to work with. 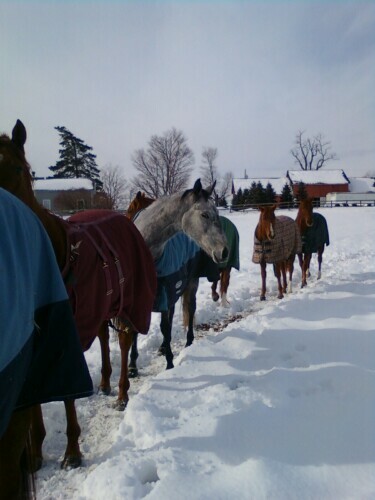 What I found fascinating (and very helpful), the horses had a consistent path that they blazed through the hard packed, icy snow, thus making it easier for them - and for me! 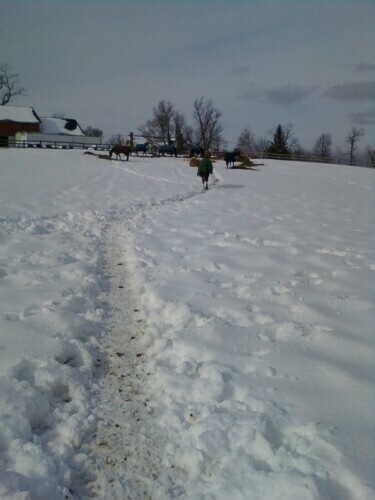 Of course, as I was getting to the last horse I had to work with, Casey, they all decided to make the most of the path and walk to the other end of their 20ish acre field. But, once I caught up with Casey and nabbed her, I began to bring her back to the barn and heard a deluge of hooves behind me - much more than the four hooves I had intended to follow me. Gotta love Conga time at Akindale. A few weeks ago, Matt and I were lucky enough to pick up a used snowblower from some family friends, Connie and Kevin. Can I just tell you how much we love that thing? Especially since it keeps snowing every 2 or 3 days? Seriously. The snow this year is ridiculous. A bonus to going to their home to get the snowblower, was going to see the new litter of puppies one of their Shelties, Vivi, had just had. Of course they're Shelties. Connie is my mom's friend and partner with Mom's uber-show-star, Checkers. Just look at these little tykes! They were just shy of 2 weeks old when we saw them, and their eyes hadn't yet opened. They're all beautiful little girls, all healthy and of good size. Some may go on to show, and others will go on to loving companion homes. But right now, they are just enjoying their heated carpeting (yep - totally serious) and sleeping and eating. Like they should be. Man, just sleeping and eating sounds like a good deal to me! First time Mama Vivi was a careful and watchful mother. She eyed us as we came in, almost a questioning look, trying to gage what our intent was for being there. I made sure to give her some attention and let her know she was a good girl, and Vivi also had Kevin nearby, who she sees every day. I picked up one puppy to hold (because really, you can't help yourself), and Vivi kept her eyes on me the entire time. She was very intense, but willing to let me hold her little bundle of joy. I held the puppy for a moment, and then put her gently back in the pen, and Vivi immediately checked her puppy all over to make sure she was ok. Watching her react to her environment and to us with her puppies was just so interesting and endearing, not so different from a new mother of a human baby. Not that I know anything about that. Yet! Of course, this post wouldn't be complete without some puppy video. They weren't doing much, but you still can't help but ooh and ahh over them. Sleepy babies. Is there anything more peaceful? Want to know what we do to amuse ourselves in a blizzard (video!)? He asked me not to post this, but I simply cannot help myself. Mojo's withering look, pliable limbs, and Matt's vocals just make me laugh until I cry every time I watch this video. Maybe you had to be there - you tell me! Please notice my ever so chic Christmas flannel pants, my 4 layers of tops to stay warm, and our awesome sheet covering the couch, keeping it free from fur. Well, as much as we can. 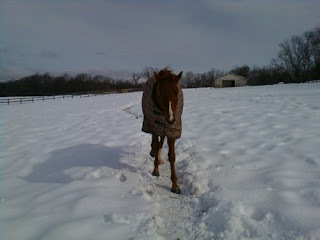 Last night, it was -1 degrees when Matt and I went out to say goodnight to the horses. In freezing times like these, I think it's important to note the good things about it - especially when I'm grumbling about not being able to feel my hands, or tromping through knee deep snow to dump the wheelbarrow. What do we do at night check, you ask? Well, we head out anywhere between 9:45 and 11, depending on my schedule for the next day - whether I have to be up early or not. We wander out in our PJs, boots and winter coats, and since it's winter, we carry hot water from the house to the barn. 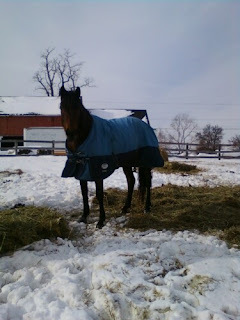 I do a quick cleanup of the stalls, Matt refills water buckets, and we make sure they have enough bedding and hay to keep them warm and entertained until the morning, when I go out to feed them. 10. Seeing Topaz being nice. She's still a cantankerous gal, but at night check, she knows her goodnight carrots are coming, so she'll take a minute to snuggle. 9. The quiet. Usually, there's not a soul outside at the hour we go out, so our neighborhood is a hushed, serene place. 8. The workout. You wouldn't think I'd be thrilled over cleaning stalls 10 minutes before bed, but it really puts the seal on my already overly physical day, so it's lights out nearly moments after hitting the pillow. 7. The moon. I've never been more aware of the moon phase as I am now. Waning Crescent, waxing crescent, full moon etc, and even the moon's position in the sky. 6. Coming back in the house. On freezing nights, I can't get into the house fast enough to warm up! It also means one of my most favorite things - sleep! 5. Matt's help. Since we moved to TMF, almost every night without fail, Matt has dutifully come out at night to help me and greet the horses. He carries heavy water buckets and helps dole out hay. It cuts my work time in half. 3. The stars. They're gorgeous and I can finally pick out a few constellations. Easy ones, like the Big Dipper and such, but they're so bright and beautiful. Some nights I just look up for a moment and take it in. 2. Matt and Siggy. When it's carrot time, Matt spends a few minutes canoodling with Siggy, and it's so nice to see him enjoying the horses I love so much. Siggy even gives him kisses and makes a face that says, "Pleeeeeeeeease Dad, can I have another one?" 1. Zeus and his antics. While I'm in his stall, every night without fail, Zeus will try to garner my attention in order to get extra love or, even better, extra carrots. I'll turn my back to get his feed bucket, turn around and there he'll be, taking a bow (a trick I taught him), or counting his blessings (pawing the ground, another trick). This is all without my cueing him, and what makes my heart melt is that he keeps his eyes on me, as if to say, "Mom, are you watching? Look at me, aren't I cute?" I can't help but give him a hug and tell him he's a good boy. This year, because we were so darn busy, we were delighted to have ordered a pizza, had some wine, and blissfully stayed on the couch with the fire going and didn't talk to anyone. Except each other. We talked about the good stuff in 2010, and joked about resolutions for 2011. Do any of you cat owners actually get your cats gifts for Christmas? We used to. But then we finally figured out that if we just pull out the same old rope, or box, or even a box another present came in, that's Christmas enough for these little kitties. And so I present Whimsy with a rope. I think this particular rope was used on one of our wedding presents, 3.5 years ago. It's still just as exciting to the cats as the day we got it! Forgive the music, which I positively cackle over - I'm still figuring out Youtube's Audioswap option, which can put music to your video if you're breathing heavily, guffawing or your husband is muttering to himself in the other room.